Churches heritage buildings and halls are notoriously difficult to heat. They are usually poorly insulated by modern day standards, and may have thick stone walls and floors, so they also may have a high thermal mass. This means they take a long time to heat up and a lot of heat energy is used in the process. This is an issue because most churches, heritage buildings and halls are occupied only intermittently, e.g. just a few hours a week for worship. 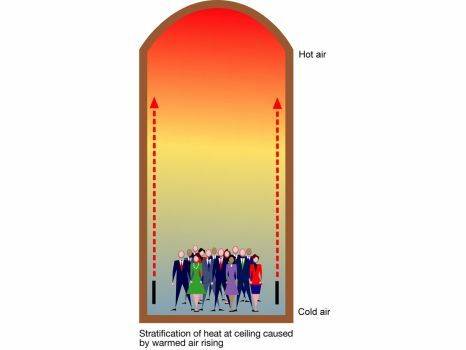 Because hot air rises, tall buildings will lose most of their warm air up in the ceiling where it's of little use to the congregation. SunSwitch heaters counter this problem. They work by heating objects rather than the air, so people quickly become warm without wasting energy. SunSwitch short wavelength infrared heaters work instantly, so there is no lengthy warm up period. This is of particularly significant benefit in intermittently used buildings where great cost savings can be made by turning on the heating only when the building is occupied. Some types of heating can cause damage to ancient buildings, their furnishings and artwork. The Wall Paintings Conservation Department of the Courtauld Institute concluded that short wavelength infrared is the kindest type of heating for ancient wall paintings. This is because it it does not heat the air in a way that might cause drying out problems. 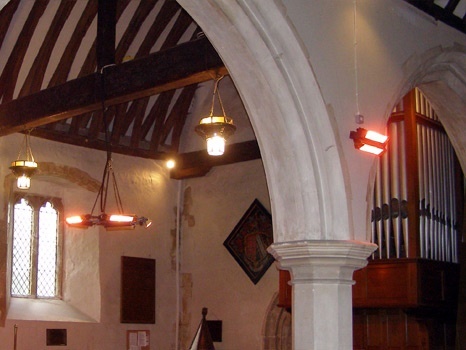 Electric heating is often the only option available to many remote churches and heritage buildings, because of the absence of water and other types of fuel. The good news is that electrically powered heating is comparatively cheap to install and significantly cheaper to run than say gas or oil. SunSwitch heaters combine instant warmth with low, calculable running costs. And since pre-warming the building for hours will not be necessary, there is virtually no energy wastage. 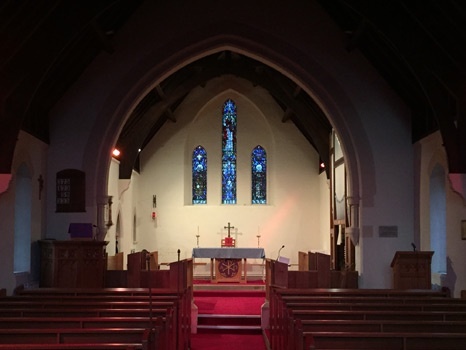 Other types of electric heating are often fitted in churches, such as off-peak storage radiators, under-pew convector tubes, wall-mounted convectors, fan assisted, and radiant overhead infrared heaters. For better economy and efficiency, these can be superseded by modern shortwave infrared quartz halogen heaters, from the SunSwitch range. SunSwitch heaters emit an off-white pink light at full output generally found very welcoming and supplementary to existing lighting. Older generation quartz halogen heaters and inferior models that do not use such advanced heater elements tend to emit an unpleasant red glow. Where a convection system, such as a radiator circuit, already exists, it may be viable to keep it for low-level background heating (e.g. frost and damp protection). SunSwitch heaters can be added for extra targeted comfort heating for when the building is occupied. This will enable an existing system to operate within its performance capabilities with greater energy efficiency, while providing the added efficiency and economy of short wavelength infrared. SunSwitch heaters combine excellent heat output with unobtrusive elegance - an important consideration where visual appearance is paramount. In all cases we would recommend the use of SunSwitch Energy Saving Comfort Controllers, which allow the heat output to be regulated as required. Adjustment is instant. SunSwitch heaters come with a bracket ready for wall mounting. They should be set at an angle of around 45 degrees to avoid heating just the tops of heads. For listed buildings or other buildings where wall mounting is not an option, SunSwitch offers a choice of elegant heater and stand combinations. These have the added flexibility that the heaters can be moved around. We are pleased to offer expert guidance on the specification and application of any our products. Please contact us on 01424 883344. Our old gas radiant heaters have been condemned - what can we do? Our old electric radiant heaters are on their last legs - what can we do?